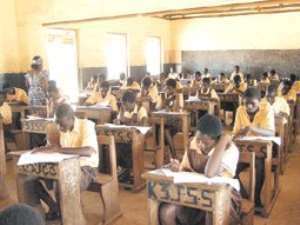 Sunyani, July 5, GNA - Three hundred and forty-six candidates of two schools are using Twene Amanfo Secondary/Technical School (TASTECH) at Sunyani as examination centre for the Senior Secondary School Certificate Examination (SSSCE), which took off throughout the country on Monday. Out of the number, 332 students were from TASTECH and the remaining 14 from Sunyani Business/Secondary (SUBSEC). Ms Georgina Boakye, Headmistress of TASTECH, told the Ghana News Agency (GNA) that a candidate of TASTECH was absent. Mr Charles Kwasi Barnes, a Supervisor in-charge of the centre, said all was going on well. At Sunyani Secondary School (SUSEC), Mr Kwasi Sie, Assistant Supervisor, told the GNA two out of the 562 candidates of the school were absent. He mentioned the absentees as Isaac Kyere, a deceased business student and Ms. Hannah Nyarko, a Vocational student.